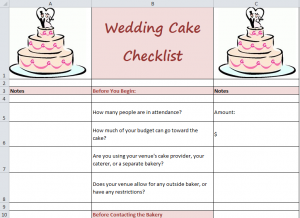 The wedding cake checklist template will help you get your perfect cake together from beginning to end. Use our simple template to easily acquire your cake and cross off one more “to-do” on your wedding list. When you have the template downloaded, you’ll see 3 columns: the middle one has the checklist, and the right and left columns are for notes. You can write directly in the Excel template, or print it and hand-write the notes. Start by figuring out how many people are going to be having cake at your wedding, as this will decide how much cake you need. From here, section your budget for the cake (this includes the creation, delivery, and other costs related to the cake) and speak with your venue about their rules regarding outside bakeries. Use recommendations or the internet to come up with a few bakeries to visit. Before calling, make sure to read online reviews to see if the bakery is worth your time. It’s also important to know how soon you need to be tasting the cake (assume at least 6 months before your wedding day to lock-down the date of delivery), and how large the cake should be (this will be one of the first things the baker asks). Browse wedding websites, Pinterest, and even the bakery sites to get ideas on how you want your cake to look. The shape and how tall or wide you want it to be, the colors, and of course the flavors are the most important items to decide on. Accents like flowers, ribbons, and other designs should be considered if you want a more elaborate cake. Also decide if you want a wedding cake topper. Some opt for just initials, others create their own toppers, and you can also order yours online. You may also want to decide if you want an “alternate” cake. This is a smaller cake made for those with allergies such as Celiac’s disease. If you have a large amount of people attending your wedding, you may want to opt for a small, plain cake so anyone with a nut or flavor allergy can still participate. First ensure they are available to deliver on your wedding date, that they meet your budget, and can fulfill all of your cake preferences. Set up times for testing, and keep a copy of their terms of service along with a list of all fees (delivery, cake cutting, etc). After you have found your baker and cake, get a written and signed agreement of all terms. Then check-in one month before your wedding day to confirm that everything is on track, and finally the day before.